Our guests appreciate a flurry of free amenities including Wi-Fi breakfast parking and an airport shuttle plus they love the convenient location at the non-smoking La Quinta Inn & Suites Tampa Bay Clearwater Airport. The two-floor La Quinta Inn & Suites has 105 spacious rooms and two suites. All accommodations include cable TVs refrigerators microwaves coffeemakers and complimentary Wi-Fi. There are free newspapers in the morning and you can gear up for the day with a complimentary continental breakfast that includes waffles. This lively hotel has a fitness center sauna heated outdoor pool with adjacent hot tub a business center meeting/banquet facilities guest-use laundromat and 24-hour front desk. Express check-in/check-out and laundry/valet services are provided as a further convenience. Parking is free of charge. Anyone without an auto can take advantage of the property's complimentary airport shuttle. 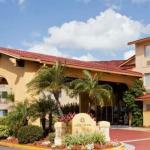 La Quinta Inn & Suites is located one-and-a-half miles from St. Petersburg Clearwater International Airport. Tampa International Airport is 12 miles away. The Tampa Bay Rays and Tampa Bay Buccaneers' stadiums are both within eight miles of the property. Clearwater Beach is 11 miles away. Shopping and dining at the seaside John's Pass Village is 15 miles from the hotel. Dogs up to 35 pounds are allowed. There are no additional pet fees. Dogs are allowed in smoking rooms only. There is a pet waiver to sign at check in. Dogs may not be left unattended, and they must be leashed and cleaned up after. Pets are allowed in smoking rooms only.